This book is brimming with adventure, magic, intrigue, and romance. It’s definitely the kind of book that you can, and will want to, read in one sitting! I paired Soul Smoke with this Domaine Du Dragon Rose. First of all, there be some AWESOME dragons in this book. And second, this book has a super sweet and SWOONY romance that just gets better and better as the story progresses. Kai is terrified at the thought of allowing any dragon into her mind…or her heart. Accepting the heartswearing and staying with the dragons means sacrificing everything, and Kai must decide if her freedom is worth risking Rhys’s life—a life more crucial to the fate of humanity than she could possibly know. I am so, SO glad that I got the opportunity to read Soul of Smoke. This book kept me on the edge of my seat from beginning to end. McFarland increases the tension, both in action and romance, steadily throughout the novel. I really enjoyed Kai as a main character. I loved that she questioned and fought against her situation throughout the story, which was a very authentic response to the type of situation she found herself in. I also loved that she had a bit of feistiness to her and was definitely not afraid to stand up for herself. Rhys is an incredibly swoony love interest. Despite his culture, his feelings, and the way he was raised, he commits to his decision to always respect Kai’s wishes even when it causes him intense physical suffering. He’s also a loyal friend and definitely the type of guy you want to have on your side in a fight. I also enjoyed that this was a story about dragons but still set in the real world. Being a Rocky Mountain girl myself, the setting certainly came alive for me, and I really enjoyed that McFarland included scenic elements that were obviously very familiar and important to her. I am always a huge fan of epic fantasies that actually make me feel something with character deaths. There was a specific character death in this book that utterly wrecked me, and I was SO thrilled that I was that connected with this story that it had that kind of impact on me. I am so excited to read the next book in this series, Shadow of Flame! The full series is out now, so I highly recommend this to all you fantasy lovers out there who hate waiting for the next book in a series to come out…and who also love some dragons and romance! The romance in this book is just so well done. It seems like it’s going to be an insta-love story, but it is not. It is so much more beautifully complex than that. The heat between Kai and Rhys is off the charts, and McFarland does a phenomenal job of constantly upping the romantic tension between them throughout the novel! As I write this I’m also wrestling with my youngest daughter, who keeps trying to put her tiny feet all over my keyboard. That’s me: a mom/wife and writer struggling to find the balance between two things that make me happy. In my mom/wife life, I stay home with three amazing little blonde girls aged seven, five, and three. I’m 30, and I feel like I’m in that place where I still have one foot in Young Mom (babies and diapers and pushing a stroller around campus) and the other in Soccer Mom (kids starting school and realizing you haven’t been in college for… you know, a while). My husband works in road construction, which means the girls and I spend a lot of time hanging out at home during the summer. I may or may not have issues keeping my house clean. I didn’t truly start writing fiction until 2009, after I had graduated college (though I did dabble a bit in high school). I got serious in 2012, when I joined my first writing group. In 2013 I won first place in the Adult Speculative Fiction genre of the LDS Storymakers first chapter contest with an entry from my story Traveler. In March of 2014 I signed with my amazing agent, Marlene Stringer. This year, 2015, I’m debuting with an entire trilogy from Harlequin’s Carina Press (check out the “books” page for more details! Have you read the Dragonsworn series yet? What are some of your favorite books with dragons? What are some of your favorite YA/NA romance novels? How clever! I love the wine pairing. 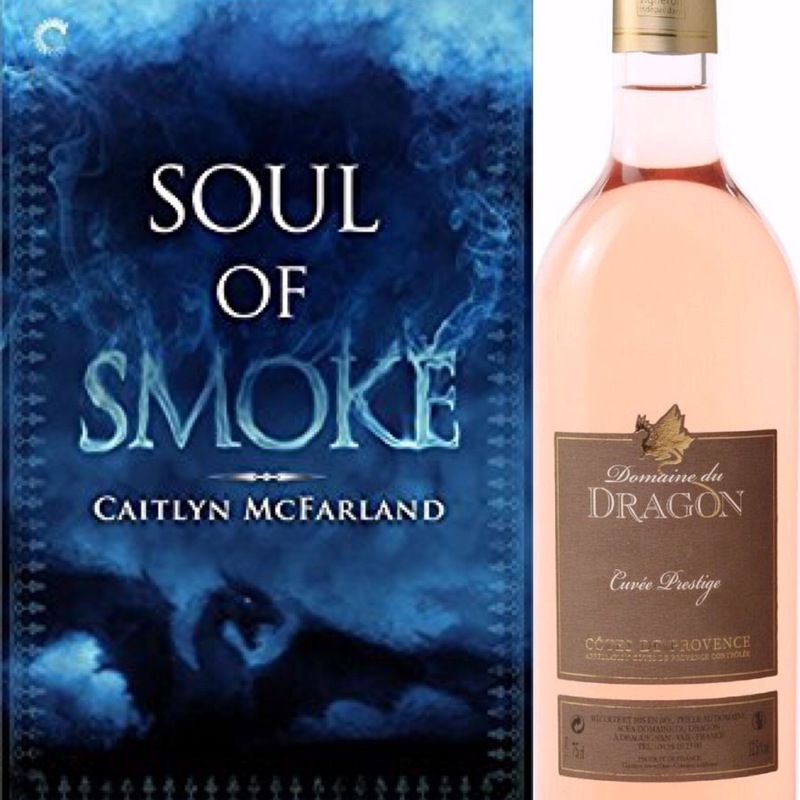 The dragon on the book cover looks similar to the one on the wine label. This sounds so cute and adorable! I love these types of relationships… Plus, dragons! Oh my. This book sounds amazing! I love any book having to do with dragons so I definitely think I would love to read this book! This book sounds right up my alley! And bonus points for all of them being out! I’m going to go add it to my TBR list right now. Thanks for sharing! Very intriguing. I’ve only recently become interested in dragons in my YA, and this could be a great way to get into them. It seems like it has some potential to be rather witty as well. And SWOONS. Wonderful review, Krysti! Great review! The dragon’s shadow was the hint that there would be dragon in his novel. Yeah, no secret about the dragons, eh?